This guest post comes from Duana Saskia Stanley, an Australian enjoying life as a software engineer at SoundCloud in Berlin. She spent an awesome 3 years before that working as a consultant developer at ThoughtWorks where she learnt heaps about Agile Software Development and Continuous Delivery. 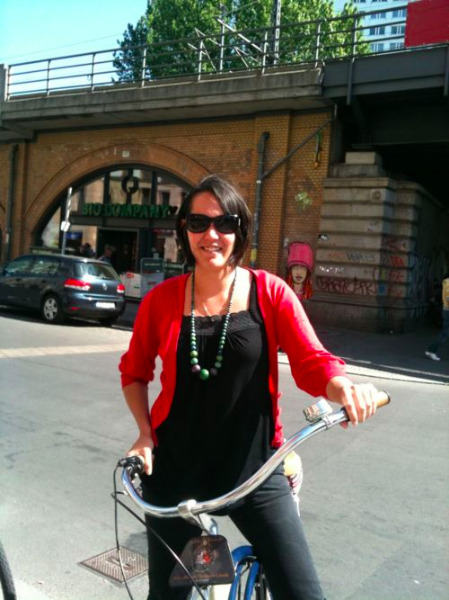 She coaches at the RailsGirls workshops in Berlin and looks forward to a future of more women in software engineering. She is a generalist who learns foreign languages for fun and beginner electronics to better understand the world software is based on. It’s all about different cultures. Men and women don’t just have different physical characteristics, we have significantly different cultures which have developed over a long time and change slowly. We have significantly different hair and clothing styles. They say we have different ways of communicating. And as groups we almost certainly have different assumptions about the world. If we see it as a difference in cultures, it’s quite easy to understand why as a female software engineer I want to meet other women in tech. Why do minority communities or expats living in foreign countries start groups to connect with other members of their country? Why do I feel an instant connection with a fellow Australian I meet in Berlin? As a girl all my “best friends” were female. It’s no wonder then that I might feel a closer connection with other women. Or that as the only female software engineer I could feel like a foreigner who has chosen to live in an exciting but foreign world. Just as I, as an Australian living in Berlin, feel no desire to meet up with other Australians living in Berlin, I know women who don’t feel any desire to meet up with other women in technology. But I do want to meet other women in tech because I want to know what their story is, what interests them and how they find it working in our environment. I want to make friends so I can get help from them and vice versa. As people who have grown up with a similar culture we share a perspective and who knows why, but we seem to like to connect with people who share our perspective. Maybe it’s so that we don’t feel alone. Maybe it’s because interaction is easier. Why I want to promote women in tech and support women to enter. 1) To let girls know what opportunities exist. When I was a kid, the first thing I wanted to be was a Journalist, because this was one of the jobs you could have on this game board I really liked called “Game of Life”. There is no reason why I chose it other than that the name sounded cool. However I continued to have this goal until I was 14. I would studiously listen to the news and take notes and I would try to find out more about being a journalist. When I hit Year 11 (16 years old) something changed. For some reason I changed track completely and started doing all science subjects. It’s because they had the most academic credibility and I always got good grades at school (because I have a good memory). I therefore saw myself as someone who was good academically and I believed I needed to follow the academic path, which was doing all the hardest subjects and then getting into either Medicine or Law - the two most prestigious careers. I didn’t get into Medicine or Law (thankfully!) but psychology and the human brain interested me, so I enrolled in a double degree of Humanities and Science where I was doing Psychology and Neuroscience. So how did I get to become a software developer? After 3 or 4 years of studying Psychology and Biology and not having any real direction, I thought I’d check out Artificial Intelligence. To do this, I had to do some Computer Science subjects. After a year of that, I decided I had been at uni too long and I needed some skills to get a decent job. Software engineering seemed a good choice – it’s the way of the future! Society will always need computers! I still don’t feel that what I’m doing is my calling in life, but I have a great job at a great company in Berlin! I can easily get work anywhere and as a software developer I can create stuff for myself and for others. It’s a valuable skill. The point is that although I did all science subjects at school, I had not heard of the careers of Software Engineering or Computer Science. The careers I had chosen as a young adult were completely arbitrary. The whole concept of a fixed career or something “to be” doesn’t suit people like me who have no strong preferences. I want women to know at least that there is the great option of working as a software developer. It’s a skill set anyone can pick up. It’s intellectually challenging, creative and pervasive across society and industries. It can be combined with lots of other pursuits. I would encourage women to take a few courses in programming to see whether it interests them. Computers weren’t as prevalent when I was young, but I was always fascinated by them. My friends had this game called “King’s Quest” and I thought it was magical. I wanted to learn more about this strange computer thing! But I didn’t know where to start. I couldn’t understand the MS-DOS manual. I would type “hello” into the DOS prompt and it would say back “Bad Command or File Name”. The boys in class would exchange pirate games and talk about how to crack passwords but I felt too embarrassed to ask them about it. Finally, at age 15, one summer break I said to a classmate who was into computers – “this summer I’m going to learn everything there is about computers!” His answer was “Duana, there’s too much to know, don’t waste your time – just stick to what you’re good at – biology and stuff”. He was my local computer expert and I listened to him. Finally at uni, I was enrolled in Computer Science and more determined this time to learn how the Internet worked – I was scared to ask stupid questions on forums and I didn’t know who to ask. I felt like a total newbie and it was not a good thing to be. So I made friends with some super-geeks so I could get some insight and help. I am still friends with the super-geeks (and they are awesome), but after a couple of years I also met a whole bunch of people who were more like me – women and not-so-geeky guys who became my friends and support network. It would have been easier if I’d had a good support network from the beginning. - For the women in and entering the industry so that they feel less like an exception. - For the men in and entering the industry so that they get to work together with women. - And, for the technology so that it benefits from different cultures influencing it.